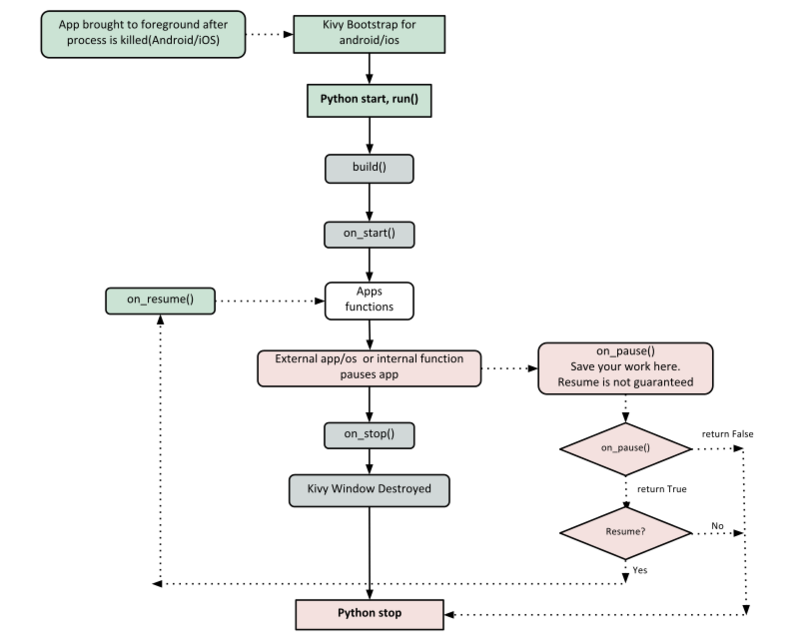 Kivy depends on many Python libraries, such as pygame, gstreamer, PIL, Cairo, and more. They are not all required, but depending on the platform you’re working on, they can be a pain to install. For Windows and MacOS X, we provide a portable package that you can just unzip and use. instantiating this class, and calling its run() method. kivy.require('1.0.6') # replace with your current kivy version ! You can save this to a text file, main.py for example, and run it. First off, let’s get familiar with the Kivy app life cycle. It’s required that the base Class of your App inherits from the App class. It’s present in the kivy_installation_dir/kivy/app.py. Go ahead and open up that file if you want to delve deeper into what the Kivy App class does. We encourage you to open the code and read through it. Kivy is based on Python and uses Sphinx for documentation, so the documentation for each class is in the actual file. One important thing to note here is the way packages/classes are laid out. The uix module is the section that holds the user interface elements like layouts and widgets. This is where we are defining the Base Class of our Kivy App. You should only ever need to change the name of your app MyApp in this line. Here we initialize a Label with text ‘Hello World’ and return its instance. This Label will be the Root Widget of this App. Python uses indentation to denote code blocks, therefore take note that in the code provided above, at line 9 the class and function definition ends. Here the class MyApp is initialized and its run() method called. This initializes and starts our Kivy application. Your application needs some complementary files to be able to run on Android. See Create a package for Android for further reference. 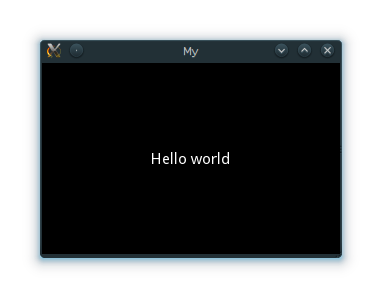 A window should open, showing a single Label (with the Text ‘Hello World’) that covers the entire window’s area. That’s all there is to it. Lets extend this application a bit, say a simple UserName/Password page. One should not forget to call super in order to implement the functionality of the original class being overloaded. Also note that it is good practice not to omit the **kwargs while calling super, as they are sometimes used internally. We ask the GridLayout to manage its children in two columns and add a Label and a TextInput for the username and password. Try re-sizing the window and you will see that the widgets on screen adjust themselves according to the size of the window without you having to do anything. This is because widgets use size hinting by default. The code above doesn’t handle the input from the user, does no validation or anything else. We will delve deeper into this and Widget size and positioning in the coming sections.